It's barely spring but tiny wildflowers more delicate than porcelain are already blossoming. On the southern path of the Cape Sebastian Trail in Gold Beach, you walk under an arched hedge of shore pine and then onto a trail with sharp switchbacks on a high bluff overlooking the Pacific Ocean. Waves some 900 feet below crash against massive boulders just offshore. 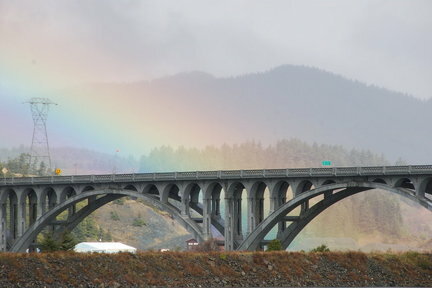 Despite its natural beauty, Gold Beach, a town of just over 2,000 year-round inhabitants, remains relatively undiscovered. You don't have to elbow other visitors out of the way to enjoy nine miles of beach or take in cliff-edge landscape. And the weather's good, too. Gold Beach sits along the Banana Belt, a stretch of coastline from Port Orford 30 miles south to the California border that is the most temperate on the Oregon coast. ... The flowers are a splash of unexpected color on a trail that is mostly greens and browns: evergreen huckleberries with pink bonnet-shaped blossoms turned toward the water; pioneer violets with scalloped leaves and yolk-yellow blooms; and Bridges' brodiaea, fragile papery white flower heads that look like opened fans. This coastal forest trail is filled with Sitka spruce and other hardy trees fighting for survival: Pine-mat Manzanita, Douglas fir, Western hemlock. Later I'll learn from Clint Emerson, botanist in the Gold Beach Ranger District, that Sitka spruce are dominant because they've adapted to the maritime air: fog and wind gusts. Their strong roots burrow deep into the soil and they don't blow over in intense storms. Just south from the base of Cape Sebastian is Myers Creek Beach with parking at the overlooks and easy beach access. In the tide pools we see huge orange and purple ochre sea stars, coral, giant green anemones, and loads of mussels. We find perfect smooth sand dollars on this beach. ... we walk to the docks in search of sea lions. The informative placards explain that this is an estuary, a basin formed at a river mouth where fresh water and salt water mix. Half a dozen large sea lions bellow at us and each other, touching noses and lumbering off the docks into the water. Several dozen white and gray seals look bored as the sun slips in and out of the clouds. The Rogue River Reef (just offshore from Gold Beach) is home to the second-largest Steller sea lion rookery south of Alaska. In late December and again in mid-March you can also see gray whales migrating through these waters. When it starts to rain, we duck into the nearby Jerry's Rogue River Museum and Jet Boat Gift Shop. It has a free museum that includes a timeline of the history of the Rogue River, hundreds of quirky artifacts (like the remains of a pioneer rifle retrieved from the banks of the Rogue River), and a diorama with a real stuffed bear, possum, wild turkey, weasels, and other area wildlife.